The New York State Bar Association (NYBSA) has selected Offit Kurman attorney Stuart B. Newman to receive the David S. Caplan Award for Meritorious Service. 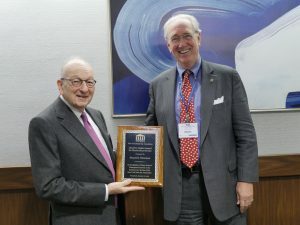 The Caplan Award for Meritorious Service recognizes recipients’ exemplary and long-term service to the NYBSA’s Business Law Section and its members. The award is given in honor of David S. Caplan, a former NYBSA executive committee member and committee chair who volunteered his time and energy to the Section over the course of multiple decades and in spite of personal physical challenges. The Award was presented at the Annual Meeting of the Business Law Section, which was held in conjunction with the NYSBA’s annual meeting. Each recipient is chosen by a committee consisting of past Section chairs. Mr. Newman has maintained an active membership in the NYSBA throughout his career. He first became involved in the Business Law Section during the 1970s. Highlights during his tenure include the development of the biennial continuing legal education course, which has been offered for more than 20 years, as well as the founding of the New York Business Law Journal, to which Mr. Newman has contributed numerous articles. Mr. Newman was one of a number of attorneys from Salon Marrow Dyckman Newman & Broudy LLP to join Offit Kurman in New York in 2018. He has been engaged in corporate and securities practice for over forty years, focusing on corporate law, private equity transactions, mergers and acquisitions, and capital formation. He has also served as a director on the boards of both publicly-traded and privately held companies, contributing a unique combination of business acumen and broad legal experience. In addition to his legal practice, Mr. Newman frequently lectures and writes on corporate law topics for various organizations, universities, groups, programs, and publications. Stuart B. Newman has been engaged in corporate and securities practice for over forty years, focusing on corporate law, private equity transactions, mergers and acquisitions and capital formation. Stuart studies his clients’ businesses thoroughly and has made valuable contributions on a range of business issues such as: joint ventures, product development, finance, investment banking, marketing and personnel. He has served as a director on the boards of both publicly-traded and privately held companies, contributing his unique combination of business acumen and broad legal experience. He has served as a director on the boards of both publicly-traded and privately held companies, contributing his unique combination of business acumen and broad legal experience.